Richard Stevens, John Grikis, and Rich Dana were Food Scientists at Heublein, Inc, a Hartford, Connecticut based food and liquor products company. Heublein was in charge of development for product lines such as A1 Steak Sauce, Ortega Mexican Foods, Smirnoff Vodka, and Jose Cuervo to name a few. The three gentlemen were especially involved with product development and quality assurance for the company’s line of food products, including Ortega Mexican Foods. When R.J. Reynolds (RJR) acquired Heublein in 1984, the three men were faced with the prospect of moving to RJR’s facility in California. 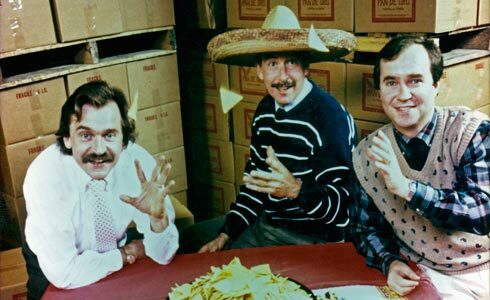 Rather than making the move, the three decided to form their own company that would satisfy a growing need in the northeast for tortillas and tortilla chips. Their work with Ortega had exposed them to the growing demand for such products as Mexican Food was making its move into the region and was appearing on an ever increasing number of restaurant menus. Using their experience in the food industry, as well as the severance pay they received from Heublein, they acquired the necessary facility and equipment to found Severance Foods, Inc. Over the years, product development efforts and high-quality standards have resulted in the company’s growth and a reputation for unique products. Today, Severance Foods is the largest manufacturer and co-packer of tortilla chips in the northeast. Our own Pan De Oro branded products have been used by restaurants, schools, and concessions since 1985. Now you can enjoy our own all-natural chips.